In the planning for the September World Meeting of Families and the visit to Philadelphia by Pope Francis there are no less than 15 major committees involved. Among the most critical is the Liturgy Committee and the Liturgical Music Subcommittee, which are both chaired by Father Dennis Gill. He really has double duty, because he is also rector of the Cathedral Basilica of SS. Peter and Paul, located along the Benjamin Franklin Parkway in Philadelphia and not far from the Philadelphia Museum of Art where the pope will celebrate Mass Sunday, Sept. 27. Actually Father Gill is not a complete stranger when it comes to assisting with plans for papal events. “When I was a teacher in Rome in the year 2000 I worked with Cardinal John Foley on the Jubilee for Entertainers and the Jubilee for Media and Journalists,” he said. While the Holy See gives a great deal of direction for papal Masses other liturgies, such as those celebrated at the Pennsylvania Convention Center for the World Meeting of Families, are planned locally, Father Gill explained. For the Sept. 27 public celebration the papal Office for Ceremonies is directly involved and has given excellent guidance, Father Gill said, but everything is governed by the church’s overarching directives for the General Instruction of the Roman Missal. Within the Liturgy Committee there are a number of subcommittees, Father Gill explained. Liturgical Ministers is headed by Kathy Morris; Liturgical Furnishings and Elements by Lou DiCocco; Liturgical Music by David Kimock; Liturgical Publications by Jean Madden, Father John Donia and the Magnificat Foundation. Mary Ann Johnson is the committee secretary. “The committee meets about every other week and I would say today we are where we could and should be for both the week and the weekend (in September),” Father Gill said. As for details, vestments have already been selected for Pope Francis, the cardinal concelebrants and deacons. Arrangements have been made for vestments for bishops in attendance. The anticipated 1,500 priests for the Mass on the parkway will simply wear their white albs and white stoles. Strictly speaking, the altar to be used for the Mass will not be on the Philadelphia Museum of Art steps as has been speculated. Looking up the Benjamin Franklin Parkway toward the Art Museum, it will be directly in front of the George Washington Monument for maximum visibility by the people assembled on the parkway and adjoining streets. New sacred vessels have been purchased for use at all of the ceremonies at the World Meeting of Families and the parkway. As an exception, the chalice that will be used at the papal Mass is the chalice of St. John Neumann, the fourth Bishop of Philadelphia. The logistics for distribution of holy Communion at the Convention Center liturgies have been worked out, but the parkway is another matter, in light of the estimated 1.5 million to 2 million people expected to attend. For that matter, the number of hosts and quantity of wine to be procured has not yet been worked out. The wine is probably not as much as one might expect because the congregation will only receive the host. Concelebrating priests at the parkway Mass will receive the Eucharist by intinction, which is dipping the Sacred Host into the Blood of Christ. 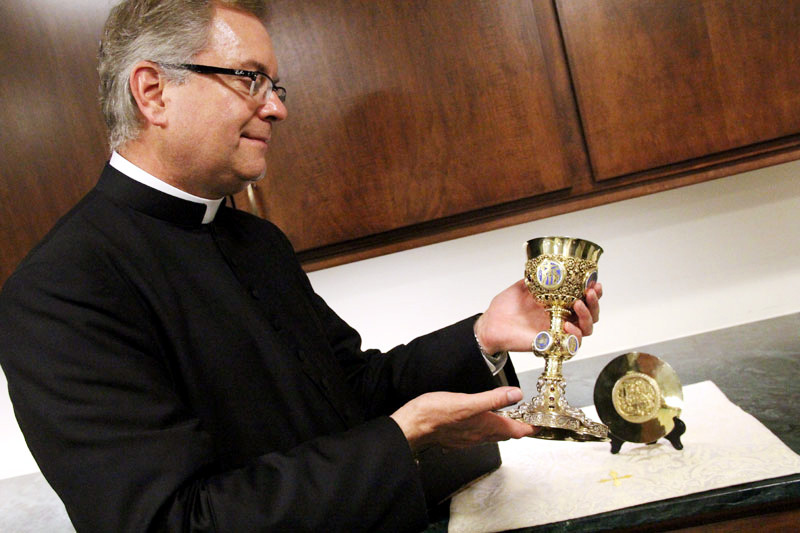 Father Gill estimates typically 25 priests can receive from one chalice but in this method it will probably be a greater number. As for the hosts — the altar breads — they are being donated by the DiCocco family, the local proprietors of the religious goods firm the St. Jude Shop in Havertown, Delaware County. 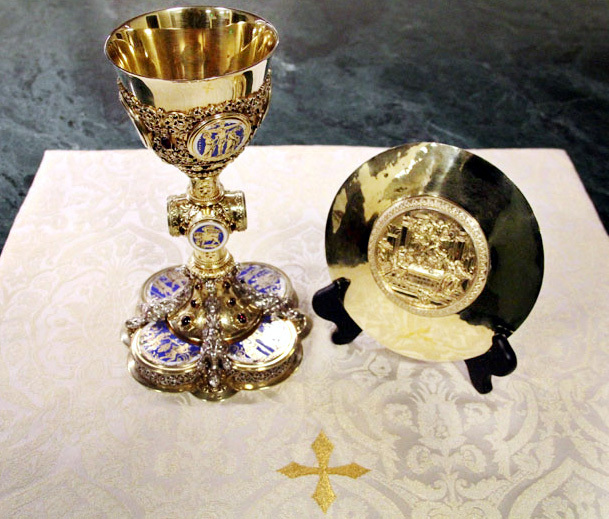 The St. Jude Shop also has the contract for the sacred vessels that need to be purchased and liturgical items needed for the World Meeting of Families, according to Lou DiCocco. His firm is also actively involved in supplying items for the pope’s visit to Washington, which will precede his coming to Philadelphia. “We are going to be extremely busy,” DiCocco said. Whether it be the Convention Center or the parkway, music will be very much part of each liturgy. “The new hymn (‘Sound the Bell of Holy Freedom’) will be sung every day,” Father Gill said. Among the choirs over the course of the week will be the 100-voice Archdiocesan Choir, the 30-voice Cathedral Choir, the 60-voice Children’s Choir and other choirs that could total 500 voices. “On Sunday we will have the assistance of the Philadelphia Orchestra, and Rodgers Organ has offered us free use of an organ for Sunday,” Father Gill said. Will the Mass be in Latin? Pope Francis doesn’t speak English, so unless he’s been practicing a lot, having the Mass in Latin makes a lot of sense to me. Also, I wonder what Mass schedules at the Parishes will be like that Sunday?